U Pay Ta Ru has become the voice for conserving forests. In his ethnic Naga village, this is no small feat. Perched high on the banks of the Chindwin River, half an hour boat ride from the Khamti town, the village is home to more than 200 ethnic Naga people. Traditionally his community is known to burn and clear forests for farming. After planting on the cleared land for a year, the community moves to a new location to start the process all over again in a practice known as shifting cultivation. “In our culture, elders lead. When I first became part of a project that raised awareness on the value of conserving forests, they were suspicious and thought that the project was about to put a ban on shifting cultivation. Now, after I have shared my knowledge with them regarding of value standing forests, they are convinced and happy to support me and our youth group,” said 22 year old U Pay Ta Ru, Secretary of the Nar Tike Village youth group. The group, made up of seven men and four women, is part of a network of 45 youth groups participating in a forest conservation programme. 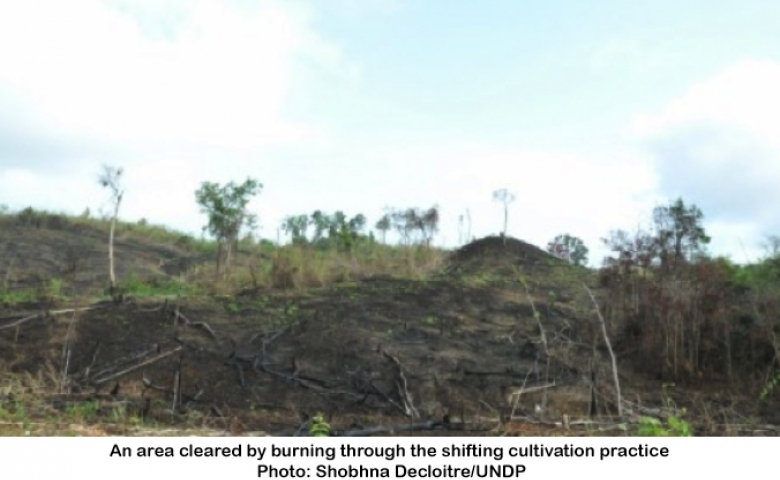 The Myanmar Reducing Emissions from Deforestation and Forest Degradation (REDD+) Readiness Programme is being implemented by the United Nations Development Programme (UNDP) in three townships – Khamti, Layshi and Lahe – in the North West of Myanmar, along the Indian border. An estimated 47% of Myanmar’s land mass is covered with forests. Ethnic communities live on approximately 0.19% of this area which is home to 99910 ethnic Naga people who mostly live though subsistence farming and hunting. These communities are located in remote areas and take a day or two to reach. Khamti can be reached via a flight from Mandalay. Lahe can be reached by road from Khamti while Layshi can be reached by travelling in a boat along the Chindwin River, followed by a journey on long narrow winding roads. “When we started this programme we first had to meet with CSOs active in the three townships to explain what it was about. We selected five youth mobilisers from these CSOs to work in each of the townships. Each youth mobiliser had to reach out to three of the participating 15 villages from every township. We made sure that the selected youth mobilisers spoke the local languages and were known in their areas. They visited the villages with our implementing partners, explained about the programme and facilitated the formation of the youth groups. Some villages were quick to come on board, others were slower. Finally we had 45 villages participating in the programme,” said Khin Hnin Myint, UNDP Project Manager. 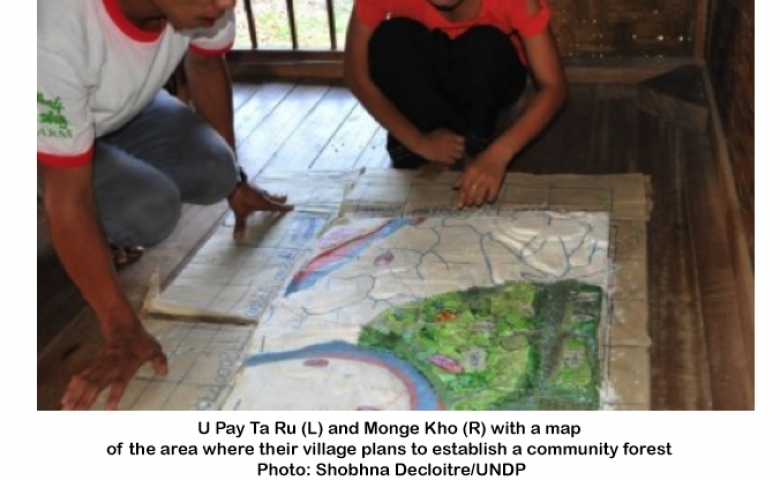 “In June last year, a CSO representative came from Khamti and explained about deforestation. He explained that it was important to conserve forests because standing forests not only protect animal and plant life, but can also get us an income from carbon trading. If forests are destroyed we need to replant trees. He encouraged youth in our village to form a group and actively start conserving the forest,” said U Pay Ta Ru. In July last year, the Nar Tike village youth group was formed. In consultation with the village elders the group developed a land use plan under which the 200 acres of land currently laying fallow, or under shifting cultivation will gradually be turned into an established forest. The youth group plans to plant agar wood, teak and bitter bean next year, using seedlings from a nursery established through the programme. The youth have also gained technical knowledge from the programme on a range of issues, including how to measure carbon stocks, establish community forests and better prepare for carbon trading. UNDP will support the establishment of community forests in three of the 45 participating villages. Community forests can be established using a nine step procedure which includes setting up a user group, a management committee, identifying the community forest site and clarifying the land ownership, developing a 30 year management plan for the forest and submitting a full application to the Department of Forest. Upon the issue of the Community Forest Certificate, the villagers can establish their community forest. A community forest provides the benefits of the forest in a sustainable manner. Forest products including wood can be harvested provided that the trees are replanted in a systematic manner. The Nar Tike Village hopes to establish its community forest in 2016 as per the land use plan they developed. Villages which wish to do so can participate in carbon trading through REDD+ , which is a climate change mitigation solution being developed by Parties to the United Nations Framework Convention on Climate Change (UNFCCC), that incentivizes developing countries to keep their forests standing. These developing countries would receive results-based payments for results-based actions to reduce forest carbon emissions. In addition to conserving forests, the programme has built the capacities of men and women involved. Monge Kho, 20, is one of the women in the Nar Tike village group. “I am not used to being a part of a group like this, where men and women work together. I have learnt many things and personally I have built my confidence and gained public speaking skills,” she said. UNDP has conducted training on gender in Khamti, Layshi and Lahe over mid-May and early June this year to encourage greater women’s participation and representation in forest conservation.